It’s been said the most difficult achievement in sports is to use a thin, round, fragile piece of wood to hit a round hard ball that’s curving, dipping, sliding and spinning in your direction at speeds exceeding 90 MPH over a fence that’s more than 350 feet away. But to do so twice, thrice or even four times in consecutive at-bats, is truly an achievement for the ages. 500HRC members Mike Schmidt and Lou Gehrig (honorary) were two of six players tied for the all-time most consecutive home runs ever hit during a single game of play – four. The others to absolutely take over a game is this way were Mike Cameron, Rocky Colavito, Carlos Delgado and Bobby Lowe. On June 3, 1932, “Iron Man” Lou Gehrig took the Shibe Park field with his New York Yankees (including the legendary Babe Ruth) to face the Philadelphia A’s. He had no idea that “on this day in baseball history”, he would become the first American League and modern player in baseball history to hit four home runs in one game. He very nearly hit his fifth homer in the game (something that no player has ever done), when he hit a rocket to deep center field only to have Centerfielder Al Simmons leap at the center field wall and snag a sure homer before it could clear the fence. On April 17, 1976, “Iron Mike” Schmidt was the most prolific home run hitter in a game in which the Philadelphia Phillies and Chicago Cubs combined for a staggering thirty-four runs in a Wrigley Field slugfest that featured nine home runs - including four consecutive long balls by Schmidt. He hit his first homer that day off Rick Reuschel, and the fourth off Rick's brother, Paul to help the Phillies rally from a 13-2 deficit to beat the Cubs 18-16 in 10 innings. Editor’s Note: “Say Hey” Willie Mays also had a four-homer game, but they were not consecutive at-bats. 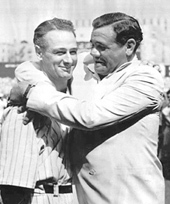 Ruth / Gehrig - Perhaps the most famous instance of two (eventual) 500 Home Run Club members (Babe Ruth and Lou Gehrig) hitting back-to-back home runs involved The Bambino’s famous “Called Shot” in the fifth inning of Game 3 of the 1932 World Series, held on October 1, 1932 at Wrigley Field in Chicago. The story goes that Ruth pointed to the center field bleachers during the at-bat in an apparent declaration that he would hit a home run to this part of the park. On the next pitch, Ruth hit a home run to center field. Despite the ensuing hysteria, pitcher Charlie Root was left in the game; but for only one pitch, which Lou Gehrig drilled into the right field seats for his second homer of the day; Root was then relieved. The Yankees won the game 7-5, and the next day the Yankees finished off the demoralized Cubs 13-6, completing the four game sweep. The "called shot" homer was Ruth's last World Series hit. In 1957 “The Splendid Splinter” Ted Williams set a unique record of hitting the most consecutive home runs over the course of four games without being called out (September 17, 20, 21, 22) with four — all the other plate appearances during those games were bases on balls (walks). On Wednesday, June 5, 1996 at Wrigley Field, Chicago Cub Sammy Sosa had a gargantuan day homering three times against the Philadelphia Phillies, including back-to-back jacks in the sixth inning (a solo shot) and in the seventh inning (with a man on). Slammin’ Sammy’s seventh inning blast was part of a five-run rally that thrilled the Wrigley Field faithful with an exciting 9-6 comeback victory. Sosa repeated this amazing feat on Saturday, August 10, 2002 at Coors Field when he flexed his home run muscle against Colorado Rockies’ pitcher Shawn Chacon and hit two, three-run blasts in consecutive innings (third and fourth frames) to lead the Cubs to a lopsided 15-1 victory. Willie McCovey swatted three home runs on September 22nd 1963, including back-to-back shots in the first and second innings of the game against the New York Mets. “Willie Mac” added a third longball in the fourth inning to clinch the Giants 13-4 victory. Editors Note: Fellow 500 Home Run Club member Willie Mays followed McCovey to the plate in the first inning against hapless Mets’ pitcher Jay Hook and promptly hit a home run. As a result, there was a McCovey/Mays back-to-back achievement sandwiched between McCovey’s personal back-to-back blasts in each of the first and second innings. 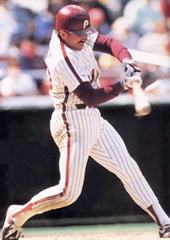 In 1978, Jackson picked up where he left off in 1977, homering in the first game to give him six round-trippers in four consecutive Series games (another record) and in the sixth game to give him seven in back-to-back Series (still another record). On August 29, 1990, Griffey, Sr. signed with the Mariners after being released by the Cincinnati Reds. The Griffeys made history by being the first father and son to play in a game together, but perhaps the most memorable event of their brief time playing together cam on September 14th of that year when Ken Griffey, Jr. and his father Ken Griffey, Sr. became the first and only father-son duo to hit back-to-back home runs in MLB history. In 1993, Griffey hit a home run in eight consecutive games, tying the record held by Dale Long and Don Mattingly. During 1997-98, Griffey joined Babe Ruth as then the only American League players (Alex Rodriguez has since joined that club) to hit 50 home runs in back-to-back seasons. When he hit 50 for the first time, he joined Willie Mays as then the only players ever to win a Gold Glove in a season in which they hit 50. In 1999, Ken Griffey, Jr. became the first American League player since Harmon Killebrew to lead the league in home runs three seasons in a row. Sosa/Griffey - On May 12, 2005, Sammy Sosa homered twice (although not back-to-back) and fellow 500 HR Club member Ken Griffey Jr. went deep once; marking just the fourth time in MLB history that two members of the 500 HRC homered in the same game. 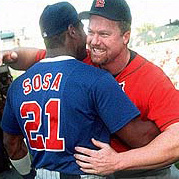 Sosa/McGwire - The ephitomy of Sammy Sosa’s homerun heroics came when both he an fellow 500 HRC member Mark McGwire crushed titanic blasts in the same game, during the fabled 1998 dual assault on Roger Maris’ all-time, single season record. After setting a major league record with 21 circuit blasts in 24 games (from May 25th through June 23rd), and another by hitting 20 home runs in June, the most ever hit in a single month, “Slammin’ Sammy” found himself neck-and-neck race with McGwire to surpass Roger Maris' record. On August 19th, McGwire was watching from first base at Wrigley Field when Sosa slammed number 48 off Kent Bottenfeld of St. Louis, pulling ahead of the Cardinals' slugger for the first time all season. But two consecutive homers by McGwire later that game reclaimed the lead. It was only fitting that Sosa stood in right field on September 8th when McGwire hit the record-setting 62nd off Steve Trachsel at Busch Stadium. As McGwire celebrated outside his dugout, Sosa ran in from the outfield to deliver a heartfelt hug to the new home king. 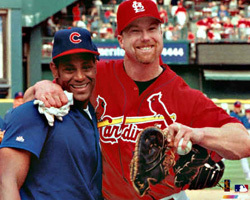 McGwire promptly lifted his friendly nemesis off his feet. 500 HRC Member Ted Williams was one of only two ML players to hit a home run off a father/son pitching duo. Teddy Ballgame knocked off a father-son tandem when he went deep off Thornton Lee on September 17, 1939 then his son Don Lee on September 2, 1960. The other slugger was “The Hawk” Andre Dawson who cranked out a Pedro Borbon fastball on June 10, 1977 then duplicated thee feat off his son Pedro Borbon on August 16, 1995. In 2004, Ramírez and David Ortiz became the first pair of American League teammates to hit 40 home runs, have 100 RBI, and bat .300 since the Yankees' Babe Ruth and Lou Gehrig in 1931. Also along with Ortiz, Ramírez hit back-to-back home runs six times, tying the major league single-season mark set by Hank Greenberg and Rudy York (Detroit Tigers) and fellow 500 HR Club member Frank Thomas and teammate Magglio Ordóñez (Chicago White Sox).